An innovation makes driver tip extra fit to universal hexagon socket screws. 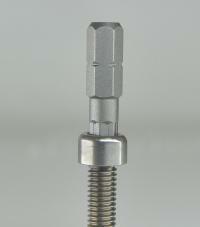 An advanced addition on hexagon tips extends service life of hexagon socket screws. Formed by forging technology, HEXtra tips are more precise to give you a positive driving experience. Unique HEXtra tip fit hexagon recesses exactly to reduce deformation of hexagon socket and extend hexagon socket screw life. HEXtra has larger contact surface to fit hexagon recesses to increase bit torque performance.